Hello, welcome back to Stamp Highlights! Today we are taking a closer look at Retro Holiday Label! 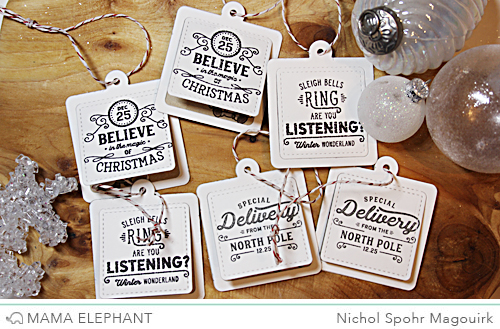 These cute sentiments sure adds a nice touch to the holiday projects! We love how Deasy created a cute scene for Christmas and the sentiment using silver embossing powder is just perfect! We love the retro label resting on top of the fireplace! Pamela combined the stamps from Pix's Holidays, Merry Mantel and Retro Holiday Labels to create this beautiful Christmas card! 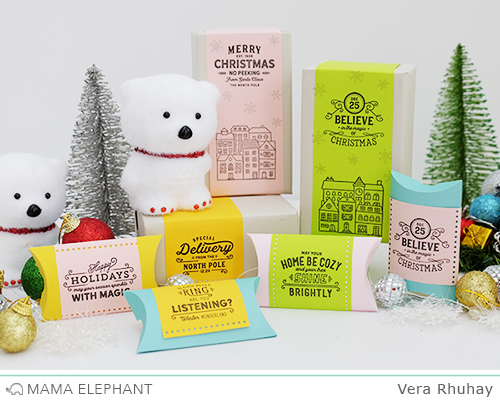 Thank you to Vera for sharing her idea of using the Retro Holiday Labels for gift packaging! 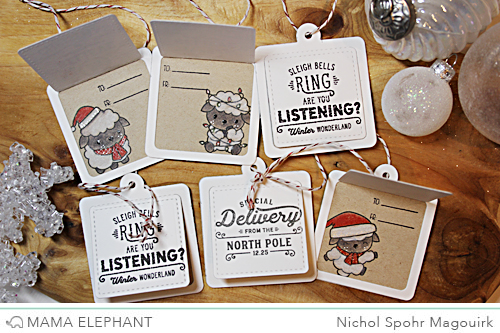 Holiday gift tags are made easy with the new Retro Holiday Labels and Union Square Tag Dies! Love the packages using the Retro Holiday labels and the cards! Pamela's background is so pretty. Melania's card is just stunning. And Pamela's adorable. And I just bought a pillow box die so loving Vera's inspiration! I love all of your beautiful and cute Christmas cards but especially the one that has my favorite color yellow in the background. I see you used my retro stamps on cards and packages. I just got these and I can't wait to use them and make my cards as special as yours are. All the cards look awesome. Wow, marvelous projects. These stamps are so, so sweet. Lovely. Cheers! I love this set and the projects shown are beautiful. Love the idea of using the labels on small packages too. Oh I love the flip up gift tags! What a great design.